This is a list of the breweries currently operating in the six states of the Bundesrepublik Deutschland which formerly comprised the DDR. In 1989, the last year before the fall of the old DDR regime, total beer production was 24 million hl. Unification and, more particularly currencey union with West Germany, caused a dramatic fall to just 7.5 million hl in 1991. Unsurprisingly, many breweries were unable to survive such drastic developments and there were many closures in the early 90's. With the rekindling of interest in local products in the East, the situation has considerably improved since. At a time when in Germany as a whole beer ouput is declining, the only states to have shown any growth are in the East. In the year 2000, production was back up to around 20 million hl. For those historically-minded, here's a ist of all DDR breweries that ever existed. Märzen Amber lager - Märzen. Seasonal. The brewery was bought by brewer Erich Babben in 1928 and named "Erich Babben Stadtbrauerei Lübbenau". In 1962 the state took a stake in the brewery and it was renamed "Erich Babben KG Stadtbrauerei Lübbenau". In 1972 the brewery was nationalised as "VEB Stadtbrauerei Lübbenau". Brewing stopped after the mashtun broke in 1974, though soft drinks were still produced. 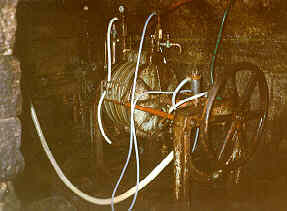 In 1996 a 50 hl brewery was installed. This was such a success that it was replaced with a 5 hl installation in 1998. Braumanufaktur Potsdamer Stange A pre-war beer style, named after the tall glasses in which it was served. Unfiltered. Wusterhausener Zwölfende Amber, top-fermenting beer. The brewery became the Schloßbrauerei Drebkau in 1870 and was owned by the Reeka family until 1949, when it was bought by Hildegard Kircher. Her father, Anton Kircher, had been a brewer since 1898 and ran the Bayrische Brauerei in Cottbus. In 1972 the brewery in Drebkau was nationalised, but it was repurchased by Hildegard Kircher's sons in 1992. Production recomenced in 1998. Landskron Pupen-Schultzes Schwarzes 3.9% 9.5º Dark lager - Schwarzbier. Landskron Hell 4.7% 11.3º Pale lager - Helles. Landskron Premium Pilsner 4.8% 11.6º Pils. Landskron Lausitzer Kindl 4.8% 11.6º Pils. Landskron Hefeweizen 5.2% 12.8º Unfiltered pale wheat beer. Landskron Ein Schlesier 5.2% 13º Pale lager - Export. Landskron Winterhopfen 5.5% 13.5º Amber lager. Seasonal - Winter. Landskron Maibock/Goldbock 6.2% 16.3º Pale Bock. Seasonal - March-June, September-January. Independent brewery. Repurchased by the Scheller family in 1992. Choriner Classic 5% Lightly hopped Pils. Choriner Herb 5% Heavily hopped Pils. Choriner Dunkel 5% Dark lager. Choriner Schwarzbier 5% Dark lager - Schwarzbier. Choriner Weizenbier 5% Wheat beer. Seasonal - Summer. Choriner Maibock 6.4% Pale Bock. Seasonal - Spring. Choriner Weihnachtsbier Seasonal - Christmas. Brewpub. The beers are also available in Öko- (organic) versions and unfiltered versions. Meierei Hell Unfiltered pale lager. Meierei Spezial Unfiltered dark lager. Schwarzbier Dark lager - Schwarzbier. Unfiltered. Seasonal. Märzen Amber lager - Märzen. Unfiltered. Seasonal. Maibock Pale Bock. Unfiltered. Seasonal - Spring. Herbstbock Dark Bock. Unfiltered. Seasonal - Autumn. Schwarzer Abt 3.9% 12° Dark lager - Schwarzbier. The cause of a long dispute between the brewery and the government. Finally it was ruled that it can be called "Bier", despite being bottom-fermented and using sugar. Hopefully another nail in the coffin of the Reinheitsgebot. Bibulibus 4.8% 11° Unfiltered pale lager. Winzerbier 4.9% 11° Pale lager. Schlaubetaler Landbier 4.1% Pale lager. Bock 6.2% 16° Pale Bock. Original Badebier Dark lager. Unfiltered. Designed to be either drunk or bathed in (I'm not kidding). Kirschbier Bock with cherry juice. Anti Aging Bier Sounds like wishful thinking to me. Closter Zell 6.3% 16° Pale Bock. Schwarzbier Extra Stark 7% 18º Schwarzbier Bock. Marathon Beer 4.8% Pils. Enriched with L-Carnitin. Independent brewery. A brewery with some interesting, some dubious and some plain weird products. Pilsator Pilsener 5% Pils. Pilsator - now there's a name that evokes some memories. 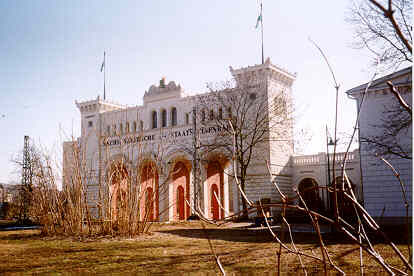 The former Oderland Brauerei which was closed in 2003 and reopened a year later after a management buyout. The largest brewery in Brandenburg. Produces "own-label" supermarket brands in addition to the beers listed. Speicher Dunkel Dark lager. Brewed with hemp flowers. Speicher Hefeweizen Wheat beer. Unfiltered. Spitzkrug Märkisches Pils 4.9% Pils. Since 1991owned by the Berliner Schultheiss-Brauerei. The brewery closed December 31st 2003. Restarted in 2004 as Frankfurter Brauhaus. Pritzwalker Schraube Pilsener 4.8% 11.2° Pils. Bärenquell Pilsener Spezial 4.8% 11.3° Pils. Brandenburger Pilsener Landbier 4.8% 11.5° Pils. Preussen Pils Premium 4.9% 11.5° Pils. Brandenburger Dunkles Bauernbier 4.9% 11.5° Dark lager. Preussen Schwarzbier Premium 5.2% 12.5° Dark lager - Schwarzbier. Brandenburger Export 5.4% 12° Pale lager - Export. Brandenburger Dunkler Bock 6.9% 16.5° Dark bock. Independent brewery. 1945-89 part of VEB Getränkekombinat Potsdam. Its beer had a very good reputation during the DDR period. Radigk's Pilsener 5.1% 12.5° Pils. Unfiltered. Radigk's Spezial Dark lager. Unfiltered. Radigk's "111" 7% 16° Dark lager. Unfiltered. Seasonal. Radigk's Radikator 6.8% 16.2° Bock. Unfiltered. Seasonal. Privatbrauerei Rheinsberg "Zum Alten Brauhaus"
Rheinsberger Kronprinzen-Pils Dunkel Dark lager. Unfiltered. Brewpub. From 1961 to 1990 VEB Brauhaus Rheinsberg. A former dairy where it was first brewed in 1906. In 1994 the old brewhouse was converted into a brewpub. The smallest brewery in Brandenburg. Brewpub in a skittle alley. Spreewälder Weissbier 5% 12.5º Unfiltered pale wheat beer. "Spreelator" Spreewälder Doppelbock 7.4% 17.5º Dark Doppelbock. Märkisches Pils 4.9% 11.5º Pils. Bitterness 30 EBU. Kyritzer Mord und Totschlag 5.3% Dark lager - Schwarzbier. Märkisches Export 5.4% 12.3º Pale lager - Export. Märkisches Urbräu 5.6% 12º Pale lager - Spezial. Bitterness 24 EBU. Märkischer Bock 6.8% 16.3º Bock. Bitterness 18 EBU. Pub, hotel and brewery housed in an old water tower and its adjacent buildings. Schwarze Jule Dark lager - Schwarzbier. Braugasthaus " Zum Alten Fritz "
Brewpub. Owned by the Stralsunder Brauerei. Visitors have expressed doubt as to whether brewing really takes place in the Alten Fritz pubs. Alten Schlachthof Hell Unfiltered pale lager - Helles. Alten Schlachthof Dunkel Unfiltered dark lager. Alten Schlachthof Weizen Unfiltered pale wheat beer. Darguner Schwarzbier 4.8% Dark lager - Schwarzbier. Darguner Klosterbräu Dunkel 5.2% Dark lager. Darguner Klosterbräu Premium 5.2% Pale lager. Darguner Klosterbräu Weihnachtsbier 5.2% Seasonal - Christmas. Owned by the Danish brewery Harboe. Brewpub in a seafront hotel on the island of Usedom. Reusenbräu Dunkel Dark lager. Unfiltered. Brewpub on the island of Rügen. Wismarer Pilsener 4.8% 11.8° Pils. Roter Eric 4.8% 11.8° Amber lager. Wismarer Mumme 4.8% 11.8° Dark lager. Herbstfestbier 5.8% 13.8 ° Seasonal - Autumn. Weihnachtsbier 5.8% 13.8 ° Seasonal - Christmas. Maibock 6.9% 16.5 ° Pale bock. Seasonal - Spring. Hop, pepper, spicy and citrus aroma; bitterish taste with pepper and butter aromas; bitterish finish with grass and butter aromas. Lübzer Export 5.4% Pale lager - Export. Lübzer Bock 7% Dark Bock. Since 1991 owned by Holsten-Brauerei AG. Kühlungsbräu Helles 4.9% 11.7º Pale lager - Helles. Trotzenburger Weizenbier 5.1% 12.3º Unfiltered pale wheat beer. Kühlungsbräu Osterbier 4.9% 11.7º Pils. Seasonal - Easter. Kühlungsbräu Maibock 6.8% 16.3º Pale Bock. Seasonal - Spring. Kühlungsbräu Festbier 5.1% 12.3º Dark lager. Seasonal - October. Kühlungsbräu Weihnachts- & Winterbier 5.1% 12.3º Dark lager - Schwarzbier. Seasonal - Winter. Rostocker Pils 4.9% 11.2° Pils. Very pale yellow colour with an uneven, large-bubbled head; metal, tobacco and grass aroma; bitter taste with grass, resin and pepper aromas; bitter finish with tobacco, resin and pepper aromas. Pleasantly hoppy and bitter. Not bad for an industrial Pils. Rostocker Dunkel 4.9% 11.6º Dark lager. Draught only. Rostocker Export 5.5% 12.3° Pale lager - Export. Rostocker Helles Bockbier 6.9% 16.2° Pale bock. Rostocker Dunkles Bockbier 6.9% 16.2° Dark bock. 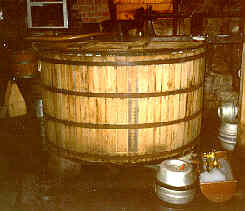 The brewery was owned for a time by Beck's of Bremen. After Beck's were taken over by Inbev of Belgium, the Rostock plant was sold on to Brau & Brunnen in late 2002. Mecklenburger Landbier 5.1% Pale lager. Schweriner Export 5.5% Pale lager - Export. Schweriner Bock 7.1% Amber Bock. Description: City centre brick building, next to the main cinema. Built as a brewpub in 1936. Large U-shaped bar with wooden floors, numerous levels, raised seating areas with partitions. In the centre, a large servery with carved wooden counter, rough-plastered vaulting above and copper brewing vessels. At the rear, a small patio. Food is a combination of modern and traditional German; the menu is in German, English and Swedish. Kegs of beer from 5-20 litres can be served at the table for parties. The home-brewed beer can be served with fruit or cherry juice. Also sells a wide range of schnapps. Stralsunder Lager 4.7% 11.5º Pale lager - Helles. Stralsunder Pils 4.9% 11.9º Pils. Stralsunder Traditionsbock 6.5% 17º Dark Bock. Stralsunder Frühlingsbock 6.5% 17º Pale bock. Seasonal - Mach to June. Störtebeker Pilsener 4.9% 11.6º Pils. Störtebeker Schwarzbier 5% 12.6º Dark lager - Schwarzbier. Dark brown colour with a dense pale tan head; roast, smoke and nut aromas; sweetish taste with burnt, caramel and toffee aromas; bitter finish with roast, burnt and liquorice aromas. Slightly pale for a Schwarzbier, but packed with roast flavours. A bit like sucking on a used match. but in a nice wa. Störtebeker Bernstein Weizen 5.3% 12.9º Amber wheat beer. Independent brewery. Bought by the Nordmann family in the 1990's. Kühlungsbräu Trotzenburger Spezial 4.9% 11.7º Pale lager - Helles. Brewpub on the island of Usedom. Brewpub. 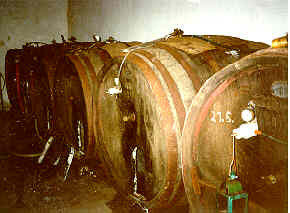 The beers are available in oak barrels of 5 to 30 litres. Altenburger Lager 4.8% 11.9° Pale lager - Helles. Altenburger Premium 4.9% 11.5° Pils. Grass and cream aroma, bitterish taste with smoke hop and grass aromas, smoky bitter finish. A reasonable beer of the style, though with slightly odd hop flavours. Altenburger Schwarze 4.9% 11.5° Dark lager - Schwarzbier. Altenburger Privileg 5.2% 12.5° Pale lager. Lemon and nut aroma, bitterish/sweetish taste with hop citrus and vanilla aromas, very bitter spicy, herbal finish. Beautiful flavour of aroma hops. Rather good. Festbier 5.5% 13.5º Amber lager - Märzen. Owned by the Leikeim brewery in the north Bavarian town of Altenkunstadt. Apoldaer Glocken Hell 4.5% Pale lager - Helles. Smoke, cardboard, celery and dust aroma; bitterish taste with smoke aroma; bitterish finish with smoke, celery and hop aromas. Apoldaer Glocken Pils 4.8% Pils. Pepper, vegetable, smoke and citrus aroma; bitter taste with smoke and citrus aromas; bitterish finish with grass aroma. Apoldaer Premium Pils 4.8% Pils. Apoldaer Gambrinus Pilsner 4.9% Pils. Apoldaer Diät Bier 4.9% Pale lager. Apoldaer Spezial Pils 5% Pils. Hop, grass, cabbage and cardboard aroma; bitter taste with smoke aroma; bitter smoky finish. Apoldaer Urtyp 5% Amber lager. Apoldaer Export 5.1% Pale lager - Export. Apoldaer Festbock 6.5% Amber bock. Cardboard aroma; neutral taste with smoke and cardboard aromas; bitterish finish with smoke and dust aromas. Founded: 1823 Closed 1992, reopened as a brewpub in 1997. Arnstädter UrStoff 5.1% 12.5° Pale lager. Arnstädter UrTyp 5.1% 12.5° Dark lager. Arnstädter UrWeizen 5.1% 12.5° Wheat beer. Unfiltered. Arnstädter UrBock 7.1% 16.5° Bock. Braugold Hell 4.8% 11.5° Pale lager - Helles. Braugold Pilsner Spezial 4.9% 11.7° Pils. Pepper, spice and basil aroma; bitter taste with pepper, malt and hop aromas; very bitter finish with pepper and spice. Riebeck Premium Pilsener 5.1% Pils. Erfurter Angerbräu Premium Pils 5.2% 12.5° Pils. Braugold Bock 6.5% 16.7° Pale bock. Seasonal - October-March. Owned by Riebeck Brauerei AG, Leipzig. It's pils was one of the best in the DDR period and has maintained its high quality up to the present. Saalfelder Grotten-Pils 4.8% 11.4º Pils. Saalfelder Dunkel 4.8% 11.5º Dark lager. Saalfelder Pilsner 4.8% 11.6º Pils. Saalfelder Premium Pilsner 4.8% 11.7º Pils. Hop and vegetable aroma; bitter taste with cabbage and grass aromas; bitter finish with hop, resin and grass aromas. Saalfelder Gaudi-Weizen 5.4% 12.5º Pale unfiltered wheat beer. Saalfelder Jubiläums-Bier 5.6% 13.5º Pale lager - Export. Ur-Saalfelder 1100 Jahre Saalfeld 5.6% 13.5º Amber lager - Märzen. Grass, malt and vegetable aroma; sweetish taste with malt and caramel aromas; bitterish finish with caramel , hop, cardboard and dust aromas. Saalfelder Bockbier 6.5% 16.5º Pale Bock. Independent brewery. Nationalised 1948, privatised 1991. Wartburg Pils 4.9% 11.3° Pils. Rennsteig Spezial 4.9% 12.5° Pale lager. Grass, cardboard, celery and dust aroma; bitter taste with dust and cardboard aromas; bitter finish with grass and hop aromas. Schwarzer Drachen 5 % 12.0° Dark lager - Schwarzbier. Caramel, cream and malt aroma; bitterish taste with cream and liquorice aromas; bitter finish with coffee and chicory aromas. Wartburg Export 5.2% 12.5° Pale lager - Export. Hop, citrus, malt and grain aroma; bitter taste with malt, grass and fruit aromas; bitter finish with grass aroma. Wartburg Märzen 5.5% 13.5° Amber lager - Märzen. Eisenacher Bock 6.5% 16.5° Amber Bock. Fruit, malt and cardboard aroma; sweetish/bitterish taste with margarine and dust aromas; bitter finish with dust and hop aromas. Winterpils Classic 4.9% 11.3° Pils. Seasonal - Winter. Since a renovation of the brewhouse, full brewing does seem to be taking place here again. For a time in the 1990's the wort was shipped in from elsewhere. The beer, which it was never wise to leave lying around very long in the DDR days, has definitely improved in quality. Schwarzes Dark lager - Schwarzbier. Open daily 11:00 - 24:00. Gasthaus & Pension "Zum goldenen Lamm"
Göltzschtal Premium Dunkel 5.2% Dark lager. Oettinger Original Hefe-Weizen 4.9% Pale unfiltered wheat beer. Oettinger Dunkle Hefe-Weizen 4.9% Dark unfiltered wheat beer. Banana, cloves, basil and aniseed aroma; nutral taste with banana, cloves and lemon aromas; spicy finish with banana and cloves aromas. Oettinger Kristall-Weizen 4.9% Pale filtered wheat beer. Oettinger Schwarzbier 4.9% Dark lager - Schwarzbier. Oettinger Export 5.4% Pale lager - Export. Oettinger Urtyp 5.6% Amber lager - Märzen. Biscuit, grass and fruit aroma; sweetish taste with cream, fruit and honey aromas; bitterish finish with biscuit and butter aromas. Oettinger Winterbier 5.6% Pale lager. Seasonal - Winter. St.-Gothardus Spezial 5.6% Pale lager - Spezial. Cardboard and dust aroma; bitterish taste with dust aroma; bitterish dusty finish. In a tasting set with some pretty bad beers, this shone out in its sheer awfulness. Total rubbish. St.-Gothardus Bock 6.5% Amber bock. Caramel, pear, peardrops and raisin aromas; very sweet taste with caramel, fruit and pepper aromas; bitterish finish with apple aroma. Much better than I expected. Pleasantly fruity, but too sweet without any balancing bitterness to be really good. St.-Gothardus Maibock 6.5% Pale bock. Seasonal - Spring. Part of the Oettinger group. Their beer was always dodgy in the DDR days. Nothing much seems to have altered since the change in ownership. There are two product ranges: the corporate Oettinger brands and the more obviously Thuringian St. Gothardus beers. Both sets are of a uniformly dreadful quality. Greizer Diät Pils Low-carbohydrate pils. Greizer Schloß Pils 5% Pils. Greizer Bock 6.7% Pale Bock. 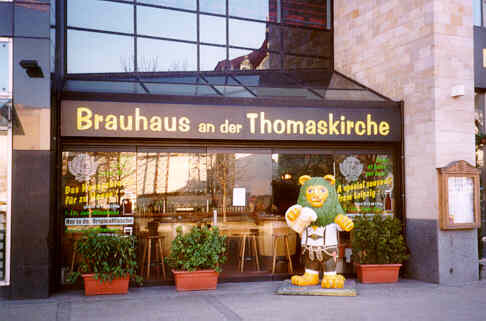 Bought by Tucher Bräu AG Nürnberg in 1991. When the parent company itself was taken over by Gebrüder März AG in 1994, the Greiz brewery passed into the hands of Erste Kulmbacher Aktienbrauerei AG. In 1997 there was a management buyout and the brewery became independent once more. It sells an unfiltered Greizer Kellerbier. Schwarzbier Dark lager - Schwarzbier. Märzen Amber lager - Märzen. Brewpub in the oldest building in Gotha. Königsee Festbier 6% Pale lager. Köstritzer Schwarzbier 4.8% 11.4º Black lager. Fruit, toast, nuts, toffee and cream aroma, sweetish/bitterish taste with fruit, cream, toast, coffee and fruit aromas, bitterish finish with liquorice, malt and espresso. Köstritzer Edel Pils 4.8% 11.4º Pils. Köstritzer Diät Pils 5% 11.2º Low-carbohydrate pils. A brewery that, unusually for Germany, is famous for a dark beer. The popularity of its Schwarzbier has caused a revival in the style and many breweries in Thüringen and Sachsen have introduced versions. Are they still really brewing here? Brauerei Adressbuch 2002 says there is currently no beer production. Brewpub serving unfiltered beers. It is also a hotel and offers packages including rooms and tours of the brewery and local sights. Mühlhausen, with its virtually intact city wall and ancient houses, is one of the prettiest towns in Thüringen and well worth a visit. The house where my sister-in-law used to live, with a stone-flagged and galeried inner courtyard was right out of the Middle Ages. No doubt the house has either had the character renovated out of it or been demolished. Just a shame only one of the three DDR-period breweries remains. Dingslebener Edel - Pils 4.9% 11-12° Pils. Dingslebener Edel - Pils Premium 4.9% 11.5° Pils. Dingslebener Diätpils 4.9% 11-12° Low-carbohydrate pils. Dingslebener Landbier 4.9% 11-12° Pale lager - Helles. Dingslebener Hefe-Weizen 5.4% 11-12° Pale wheat beer. Unfiltered. Dingslebener Lava 6% 13.5° Dark lager - Schwarzbier. Dingslebener Bock 6.4% 16° Pale bock. Independent brewery. Notable for having been prvately owned throughout the DDR period. Erster Jenaer Brau - Gasthof "Mühlenbräu "
Jenaer Burschenpils 4.5% 11.2° Pils. Jenaer Deutsche Pilsener 4.5% 11.8° Pils. Jenaer Premium Dunkel 5.2% 12.3° Dark lager. Alt-Jenaer 5.8% 16.8° Amber bock. Jenaer Schellenbier 5.8% 16.8° Dark bock. Meininger Black Jack 4.4% 12.9º Dark lager - Schwarzbier. Thuringia Braumeister 4.7% 11.2º Pale lager - Helles. Meininger Gold-Urhell 4.7% 11.2º Pale lager - Helles. Landsbergbräu Export 4.7% 11.2º Pale lager - Helles. Meininger Frisches Pilsener 5% 11.6º Pils. Thuringia Export 5.2% 12.3º Pale lager - Export. Meininger Hefeweizen 5.3% 12º Unfiltered pale wheat beer. Meininger Heller Bock 6.3% 16.3º Pale Bock. Meininger Maibock 6.3% 16.3º Pale Bock. Seasonal - Spring. Meininger Winterbock 6.3% 16.3º Dark Bock. Seasonal - Winter. Independent brewery. Bought by Klaus Weydringer (from a Franconian brewing family) in 1999. Neunspringer Pilsner 4.99% 11.2º Pils. Neunspringer Premium Pilsner 4.99% Pils. Neunspringer Schwarzbier 5.3% 13.52° Dark lager - Schwarzbier. Neunspringer Dunkler Bock Dark bock. Neunspringer Weihnachts - Dunkel 5.3% 13.52° Dark lager. Seasonal - Christmas. Founded as Brauerei H. Carl Kunze and owned by the Kunze family until 1952. Brewpub. Part of some organic market/retaurant complex. Given the lack of mention of beer on their website, I suspect they no longer brew. Brauerei Reizlein "Zur goldenen Henne"
Independent brewery. One of the handful of very small breweries to remain in private hands throughout the DDR period. Rhöner Pils 4.5% 11.5º Pils. Pummpils 4.5% 11.9º Unfiltered Pils. Rhöner Land-Premium 4.5% 11.9º Amber lager. Caramel, malt and flowers aroma; bitter taste with hop, pepper and malt aromas; very bitter finish with pepper and wood aromas. Rhöner Spezial-Export 4.8% 12.5º Pale lager - Export. Hop, wood and citrus aroma; bitter taste with dust, butter and grass aromas; bitter finish with dust and resin aromas. Rhöner Edel-Export 4.8% 12.5º Pale lager - Export. Rhöner Urtyp Dunkel 4.9% 12.7º Dark lager. Rhöner Kristallweizen 4.9% 12.4º Ffiltered pale wheat beer. Rhöner Schwarze Hefeweizen 4.9% 12.4º Unfiltered dark wheat beer. Rhöner Weisse 4.9% 12.4º Unfiltered pale wheat beer. Rhöner Bock 6% 16.5º Pale Bock. Seasonal - Winter. Rhöner Weihnachtsbier 4.8% 12.5º Pale lager. Seasonal - christmas. Independent brewery. Nationalised in 1972. Repurchased by members of the Dittmar family in 1990. Rosen Pils 4.8% 11.2° Pils. Spice and metal aromas; bitterish taste with metal and smoke aromas; bitter finish with metal and hop. Rosen Spezial Pils 4.9% 11.3° Pils. Schwarze Rose 4.9% 12.3° Black lager. Malt, fruit, toffee and burnt aromas; neutral taste with cardboard aroma; bitterish finish with cardboard and metal aromas. Rosen Dunkler Bock 6.5% 16.5° Dark bock. Independent brewery. Nationalised in 1951, in 1991 it came back into the hands of a descendent of one of its founders. Cardboard and dust aroma; bitter taste with grass, hop and dust aromas; bitter finish with dust and resin aromas. Raubritter Dunkel 5% Dark lager. Chicory, toffee, pepper and malt aroma; sweetish/bitterish taste with cream, malt, liquorice and toffee aromas; bitter finish with black toffee, coffee and pepper aromas. Sonnen-Weisse 5% Unfiltered pale wheat beer. Schwarzbacher Narrenkrug Faschingsbier Pale lager. Made specially for the carnival in Schwarzbach. Schwarzbacher Weihnachtsbier Amber lager. Seasonal - Winter. Independent brewery. Nationalised in 1949. Reacquired by the Trier family in 1990. Singer Bier 4.7% Pale lager. Hop, mint, flowers and grass aromas; very bitter taste with hops, vanilla, butter and grass aromas; very bitter finish with hop, wood and pepper aromas. Brauerei Schmitt is a tiny village brewery, that was once the smallest in the DDR and possibly all of Germany. 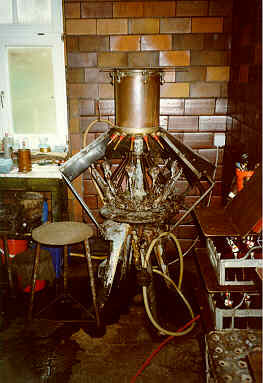 It has been in the hands of the Schmitt famiy since 1885. 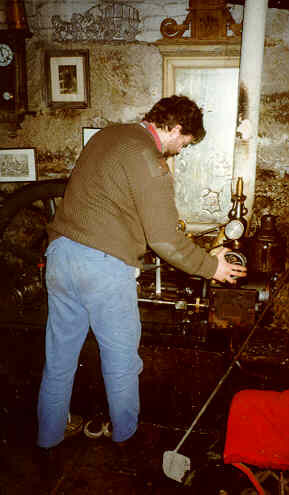 Most of the equipment dates from the 1890's, including a miniature steam engine which powers all the machinery. 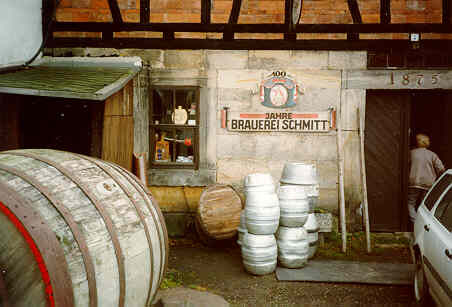 It was already designated a "museum brewery" in 1977, during the DDR period. Run by members of the Schmitt family, it was never nationalised because of its small size. The single, pale lager brewed here is of exceptional quality. The primary fermentation, which lasts a week, takes place in open fermenters. The only concession to the modern age are stainless steel lagering vessels, though the lager keller still contains some oak barrels, too. Here the beer is lagered for 5 weeks. The beer is then filtered and either bottled or kegged. The filtering, bottling and bottle-washing equipment is all pre-war. The beer only has a shelf-life of 3 weeks because it is not pasteurised. That isn't usually a problem, as the beer is only sold in the immediate vicinity of the brewery. The idyllic location is extrememly difficult to find, the name Singen only appearing on signposts when you get to within a kilometer or two of the village. It supplies draught and bottled beer to a few pubs in the area. Their bottled beer can also be purchased by individuals directly from the brewery. Bought by Richard Schmitt in 1893 and in the family's hands ever since. Operating under the name Turmquell Brauerei, this was one of the 3 breweries in Mühlhausen at the time of German reunification. By 1994, all three had closed. 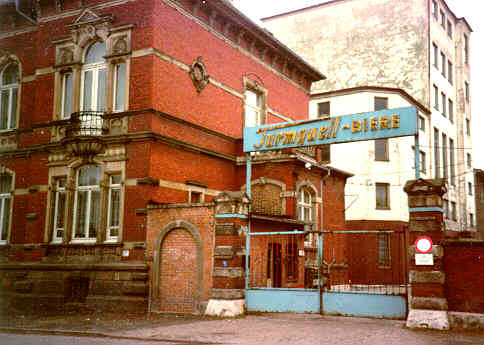 In 1999 this brewery was re-opened, though some of the old buildings were demoished and a new small brewing plant was installed. The photo above is from the mid-1980's. The brewery offces (The red brick thingy on the left) are pretty much unchanged. Sadly, the classy Turmquell sign has been removed. If I remember correctly, it was producing only bottled beer in the 1980's. I fear this brewery may have closed. Pepper an malt aroma; bitter taste with grass aroma; bitter finish with wood, resin and margarine aromas. Thüringer Tannenbräu Pils 4.9% Pils. Thüringer Tannenbräu Edel Export 5% Pale lager - Export. Thüringer Tannenbräu Diät-Pilsener 5.2% Pils. Thüringer Tannenbräu Spezial 5.4% Pale lager - Spezial. Smoke, cardboard and dust aroma; bitter taste with grass and cardboard aromas; bitter finish with dust and grass aromas. Waldhaus-Pils 5% 12.1° Pils. Unfiltered. Stockdunkel 5% 12.1° Dark lager. Dunkles Bockbier 6% 16.5° Dark bock. Seasonal - October. Weihnachtsbier 5.5% 14.5° Seasonal - December. Faschingsdoppelbock 7.5 - 7.8% 21° Bock. Seasonal - February. Brewpub on the edge of Erfurt. The Waldhaus pub (in the middle of the Steigerwald) was built in 1888 by the Aktien-Brauerei-Erfurt as a destination for day-trippers. In the 1960's it was taken under state control. Between 1993 and 1994 it was restored and converted to a brewpub. All the beers are unfiltered. Steigerwald spezial Dark lager - Schwarzbier. Unfiltered. Dunkler Bock 6.7% 16.5º Dark Bock. Unfiltered. Seasonal. Watzdorfer Burg Pils 5% 11° Pils. Watzdorfer Burg Export 5% 12° Pale lager - Export. Watzdorfer Schwarzbier 4.8% Dark lager - Lager. Watzdorfer Burg Bock 7% Dark Bock. There are brewery tours on Tuesday and Thursday at 10:00, 13:00 and 15:00. Weißenseer Ratsbräu 5% Pale lager. Es soll auch nicht in das Bier weder Harz noch keinerlei andere Ungefercke. Darzu soll man nichts anderes geben als Hopfen, Malz und Wasser. Beer should not contain resin or anything else harmful. Nothing other than hops, malt and water should be used. The brewers' organisation in Saxony. The restored old premises and brewing equipment of Private Brauerei Rechenberg. Altstadtbrauhaus Märzen Amber lager - Märzen. Seasonal. Altstadtbrauhaus Weihnachtsbier Seasonal - Christmas. Altstadtbrauhaus Maibock Pale Bock. Seasonal. Bautzener Original 4.9% 11.6° Pils. Bautzener Kräusen 4.9% 11.6° Pils. Unfiltered. Bautzener Kupfer 5.2% 12.6° Amber lager. Bautzener Schwarzbier 5.2% 12.6° Dark lager - Schwarzbier. Nationalised in 1946 and in 1955 renamed "VEB Bautzener Brauerei". In 1991 it fell into the hands of the Treuhand, who halted production at the brewery, but continued to have beer contract brewed. In 1992 it acquired a new private owner and Bautzener Pils continued to be contract brewed. In 1996 a much smaller brewpub was opened in the centre of Bautzen, which inlcuded some copper vessels rescued from the old brewery site. Leipziger Gose 5.2% Gose. Top-fermented wheat beer brewed with coriander and salt. Coriander and ginger aroma; sourish tast with coriander, wheat and citrus aromas; buttery, spicy finish. Lemon, basil and buter aroma; bitter taste with herbal and butter aromas; bitter finish with hop, resin and wood aromas. Heizer Dark lager - Schwarzbier. Unfiltered. Chicory, hop, coffee, grass and burnt aroma; bitterish taste with coffee, basil, grass and citrus aromas; a very long bitter finish with coffee, cream and malt aromas. Kuppler Dark unfiltered wheat beer. Lemon, ginger, cloves and chewing gum aroma; neutral taste with cloves, basil and banana aromas; spicy wheat finish with cloves and banana aromas. Brewpub and brewery complex in an old railway station. One of only three breweries in the world producing Gose. All the beers - in very different styles - are excellent. This is one of the best new German brewpubs. Owned by Thomas Schneider, a brewery owner from Bavaria. In response to commments on Ratebeer, this is an acceptable strength for a porter and why does everyone (who never tasted any of it themselves) assume that DDR beer was crap? It wasn't. The standard was a good deal better than in the Netherlands. Löbauer Bergquell Pilsner 4.7% Pils. Deutsches Schwarz(geld)bier 4.7% Dark lager - Schwarzbier. Löbauer Bergquell Gold 5.1% Pale lager. Lausitzer Hefeweizen Unfiltered pale wheat beer. Strong Porter 7.5% 18° Porter. Lausitzer Berg-Bock 7% Amber Bock. Löbauer Bergquell Maibock 7% 16º Pale bock. Seasonal - March to May. Bergquell must surely be the only brewery in Germany to brew two porters. Two of the beers I would most like to try. Bockbier Bock. Seasonal - Spring and Autumn. Microbrewery. Part of Missionshof Lieske, a residential home for the disabled. The brewery was originally founded around 1870 and closed in 1968. Böhmisch Brauhaus Edel-Sünde 4.6% Dark lager - Schwarzbier. Böhmisch Brauhaus Pilsner 4.95% Pils. Böhmisch Brauhaus Bock 6.5% Pale Bock. Seasonal. Braustolz Doppel Caramel 1.2% Malzbier. Unfiltered. Braustolz Lager 4.5% Pale lager - Helles. Braustolz Black Art 4.9% Dark lager - Schwarzbier. Braustolz Landbier 5.2% Pale lager - Export. Braustolz Spezial 5.4% Pale lager - Spezial. Braustolz Bock 6.5% Dark Bock. Kappler Festbier 5.4% Pale lager - Spezial. Owned by the Kulmbacher Brauerei AG (as also is Sternquell in Plauen). Einsiedler Weißbier Dunkel 4.7% 11.5° Dark unfiltered wheat beer. Bitterness 18 EBU. Einsiedler Weißbier hefetrüb 4.7% 11.5° Pale unfiltered wheat beer. Bitterness 15 EBU. Einsiedler Privat Pils 4.9% 11.3° Pils. Bitterness 35 EBU. Einsiedler Jubiläums Pils 4.9% 11.5° Pils. Bitterness 33 EBU. Einsiedler Schwarzbier 4.9% 11.8° Dark lager - Schwarzbier. Bitterness 29 EBU. Einsiedler Zwickelbier 4.9% 11.5° Unfiltered pale lager. Einsiedler Landbier 5% 11.8° Pale lager - Helles. Bitterness 26 EBU. Einsiedler Heller Bock 6.5% 16.5° Pale Bock. Bitterness 22 EBU. Einsiedler Doppel Bock 7.5% 18.5º Doppel Bock. Bitterness 22 EBU. Einsiedler Mai-Bock 6.5% 16.5° Pale Bock. Bitterness 22 EBU. Seasonal - Spring. Helles Zwickel 5% 11.9° Unfiltered pale lager. Schwarze Seele 5% 11.9° Dark lager - Scwarzbier. Brewpub. The original brewery closed in 1974. Reopened in the 1990's as a brewpub. Döllnitzer Rittergutsgose 3.9% Gose. A descendant of the owners of the Rittergut Döllnitz, Adolf Goedecke, has this new Gose brewed for him. According to a text from 1824, Rittergut brewed the only genuine Gose. Apple and pear aroma; sour taste with apple, horseblanket and lemon; sour fruity finish with lemon and apple aromas. Bauer Hell 4.6% Pale lager - Helles. Bauer's Schwarzes Bier 4.9% Dark lager - Scwarzbier. Brewed since 1993. Bauer's Kellerbier 5% Unfiltered pils. Bauer's Bockbier 6.1% Dark Bock. The brewery was nationalised in 1972 and operated under the name of Turmbräu until repurchased by the Bauer family in 1990. The current man in charge, Hans Bauer, is the eigth generation of the family to run the brewery. The brewery buildings are protected monuments. For some reason their beers are virually impossible to find in Leipzig's pubs. Dresdener Felsenkeller PIls 4.8% Pils. Dresdener Felsenkeller Urhell 5.2% Pale lager - Helles. Dresdener Felsenkeller Spezial 5.4% Pale lager - Spezial. Feldschlösschen Export 5.4% Pale lager - Export. Basil, flowers and spice aroma; bitter taste with butter, grass and pepper aromas; very bitter finish with resin, hop and citrus aromas. Feldschlösschen Urbock 7% Dark bock. Apple and raisin aroma; sweet taste with caramel toffee and apple aromas; bitterish finish with fruit and toffee. Schwarzer Steiger 4.8% Dark lager - Schwarzbier. Caramel, liquorice andcream aroma; neutral tastewith cream and malt aromas; bitterish finish with cream aroma. An amalgamation of several Dresden breweries, which operates under the Feldschlösschen name. The beers are actually brewed at the Coschütz plant, which was built in 1981 to replace the existing run-down facilities of Waldschlösschen and Falkenbrauerei. Part of the Holsten-Gruppe (owned by Carlsberg). Fiedler Pilsener 4.7% 11° Pils. Orgelpfeifenbräu Landbier 4.7% 11° Pale lager - Helles. Fiedler Magisterbräu 4.7% 11° Dark lager. Fiedler Export 4.9% 12° Pale lager - Export. Fiedler Abrahamsbock 6.1% 16° Amber bock. Fiedler Bockbier 6.1% 16° Dark bock. Seasonal - September to April. Independent brewery. Another one of the very small breweries to remain in private hands throughout the DDR period. It has been in the hands if the Fiedler family since 1855. Hop, grape, vegetable and malt aroma; bitterish taste with vegetable, wood and pepper aromas; bitter finish with resin and wood aromas. Freibergisch Schwarzes Bergbier 4.9% Dark lager - Schwarzbier. Freibergisch Export Spezial 5.5% Pale lager - Export. Freibergisch Jubiläums Festbier 5.8% Amber lager - Märzen. Freibergisch Bock Dunkel 6.7% Dark bock. Part of the Actris Gruppe. Nationalised 1946, privatised 1990. Schwarzbier 5% Dark lager - Schwarzbier. Giesser Dunkel Dark lager. Unfiltered. Bastei Bock Bock. Seasonal. Unfiltered. Sächsisches Rauchbier Smoked lager. Seasonal. Unfiltered. Glückauf Edelpils 4.8% 11.6° Pils. Glückauf Pilsener 4.9% 11.5° Pils. Glückauf Edel 4.9% 11.7° Pale lager - Helles. Glückauf Schwarzbier 5.1% 11.8° Dark lager - Schwarzbier. Glückauf Das Deputat 5.1% 11.8° Pale lager. Karl May Premium Pils 5.2% 11.6° Pils. Glückauf Bock 5.9% 16.0° Dark Bock. Helle Gose 4.9% Gose. Unfiltered. Brewed with salt and coriander. Dunkle Gose Dark Gose. Unfiltered. With a smoky flavour (according to the brewery). Aaaaah - I want to try this beer. Lautenthaler Zwergenbräu Brewed for "Hotel und Restaurant Brauhausstuben" in Lautenthal. Kaiser Klee Gold Brewed for "Restaurant Kaiserklee" in Goslar. Microbrewery. You can't help but admire any brewery that makes two different versions of Gose. And in Goslar, too, the home of the style. HammerBräu Pils 12º Pils. Unfiltered. HammerBräu Märzen 12.5º Amber lager - Märzen. Unfiltered. Brewpub next door to Mercure hotel. Kanonier Dark lager - Schwarzbier. Apple, grape, butter and grass aroma; bitter taste with grass and butter aromas; bitter finish with wood and grass aromas. Ur-Krostitzer Schwarzes 4.9% 11.5° Dark lager - Schwarzbier. Ur-Krostitzer Feinherbes Pilsner 5% 11.7° Pils. Sweaty sock aroma, bitter taste with fruit butter and cardboard aromas, very bitter spicy finish. Since 1990 owned by the Binding-Brauerei AG (now the Radeberger-Gruppe). Landskron Pupen-Schultzes Schwarzes 3.9% 9.5º Dark lager - Schwarzbier. Introduced in 2003. Landskron Hell 4.7% 11.3° Pale lager - Helles. Landskron Premium Pilsner 4.8% 11.6° Pils. Landskron Lausitzer Kindl 4.8% 11.6° Pils. Landskron Ein Schlesier 5.2% 13.0° Pale lager - Export. Landskron Hefeweizen 5.2% 12.8º Unfiltered pale wheat beer. Bitterness 11 EBU. Landskron Winterhopfen 5.3% 13.5° Pale lager - Festbier. Seasonal - Winter. Landskron Maibock/Goldbock 6.2% 16.3° Pale bock. Seasonal - Maibock: March to June, Goldbock: September to January. Independent brewery. Nationalised in 1972. Repurchased by the Scheller family in 1992. The brewery also owns the Landskron Brauhaus Cottbus brewpub in Brandenburg. Lotters Hell 4.9% 12.4º Pale lager. Unfiltered. Lotters Dunkel 4.9% 12.4º Dark lager. Unfiltered. Lotters Weissbier 4.9% 12.4º Unfiltered pale wheat beer. Lotters Starkbier Bock. Unfiltered. Seasonal. Lotters Märzen Märzen. Unfiltered. Seasonal. Lotters Maibock Pale Bock. Unfiltered. Seasonal. Lotters Spezial Pale lager - Spezial. Unfiltered. Seasonal. Mauritius Zwickauer Pilsener 4.9% 11.2º Pils. Hop, grass, celery and musty aroma; bitterish taste with dusty, musty and cardboard aromas; bitter finish with hop and cardboard aromas. Mauritius Zwickauer Schwarzes Gold 4.9% 11º Dark lager - Schwarzbier. Mauritius Zwickauer Urtyp Export 5.5% 12º Pale lager - Export. Mauritius Zwickauer Bock Dunkel 7.1% 16º Dark Bock. Biggest selling Bock in Sachsen (according to the brewery). Bought in 1990 by Dinkelacker-Schwaben Bräu (part of the Spaten-Löwenbräu-Gruppe). Independent brewery. The Mittweidaer Löwenbräu beers are brewed at the company's Hartmannsdorf brewery (see below). Hartmannsdorfer Hell 5.3% Pale lager - Helles. Mittweidaer Löwenbräu Pils 4.9% Pils. Mittweidaer Löwenbräu Black Lion 5.4% Dark lager - Schwarzbier. Mittweidaer Löwenbräu Export 5.5% Pale lager - Export. Independent brewery. The last brewery in Saxony to be privatised (1994). Eibauer Helles Landbier 4.1% 10º Pale lager - Helles Schankbier. Lausitzer Dunkel 4.2% Dark lager - "Art oud bruin" (according to the brewery). Eibauer Schwarzbier 4.5% 11º Dark lager - Schwarzbier. Eibauer Pilsner 4.8% 11º Pils. Eibauer Dunkler Bock 6.4% 16º Dark Bock. Eibauer Klosterbier 5.3% 13º Dark lager - Festbier (brewery's description). I would call it a Dunkles Export. Brewed with the approval of the St. Marienthal monastery. Independent brewery. Nationalised in 1972, in 1990 it was repurchased by the Münch family. The only German brewery I know to produce 4 different dark lagers at different strengths. No surprise then that it's close to the Czech border. Neustadt Hell 4.8% Pale lager. Unfiltered. Elbhang Rot 4.9% Amber lager. Unfiltered. Hecht Alt 5% Alt. Unfiltered. Lenins Hanf 5.4% Pale lager with hemp. Unfiltered. Wilder Mann 7% Dark bock. Unfiltered. Seasonal - September to April. Brewpub. Their website has disappeared, so perhaps they've closed. Paradies Quell Pilsener 4.9% Pils. After the brewery's closure, beer under the Paradies Quell name was supplied by Brauerei Ziegler Waldsassen from the Oberpfalz. Radeberger Pilsner 4.8% 11.8º Pils. Was part of the the Binding-Brauerei AG group until that was renamed the Radeberger-Gruppe. A one-product brewery. Radeberger was one of the DDR's "export breweries" and consequently received better-quality raw materials and more investment than most. Since reunification sales have steadily increased. Independent brewery. Nationalised in 1972, returned to family ownership in 1990. Brews exclusively draught beer, though this inlcudes "mini-barrel" giant cans. After a new brewery was built in 1993 the old premises were restored as Sächsische Brauereimuseum. Reichenbrander Unser Helles 4.2% 10.3° Pale lager - Helles. Reichenbrander Kellerbier 4.8% 11.3° Pale lager. Unfiltered. Reichenbrander Dunkelbier 4.8% 11.3° Dark lager. Reichenbrander Premium 5.5% 12.7° Pale lager - Spezial. Reichenbrander Bockbier 6.5% 16.7° Dark Bock. Independent brewery. Nationalised in 1972 and production of draught beer stopped. In 1990 Joachim Bergt was able to buy back the brewery and a year later production of draught beer resumed. Opened in 1994 to celebrate the 120th anniversary of the brewery. It is housed is a disused part of the brewery which faces onto the street. The unfiltered Kellerbier is on of the four Reichenbrander beers available on draught. It also serves traditional food. Reudnitzer Diät-Bier 3.9% 7.7° Pale lager. Low carbohydrate beer. Reudnitzer Pilsner Premium 5% 11.5° Pils. Liquorice, fruit, bread and coffee aroma; bitterish taste with fruit and cardboard aroms; bitter finish with smoke, coffee, liquorice and cream aromas. Reudnitzer Export 5.4% 12.5° Pale lager - Export. Reudnitzer Heller Ur-Bock 6.9% 16.3° Pale Bock. Reudnitzer Festbier 5.6% 12.8° Pale lager - Festbier. Seasonal. Reudnitzer Weihnachtsbier 5.6% 5.6% Pale lager - Festbier. Seasonal - Christmas. Vegetable and grass aroma; bitter taste with grass, dust and resin aromas; very bitter finish with grass and hop aromas. Surprisingly good for a hop extract beer. A bit dusty but pleasantly hoppy. Better than it used to be in the DDR time. Bought in 1991 by Brau und Brunnen of Dortmund. Schwerter Privat Pils 4.9% Pils. Schwerter Red Lager Ice-Beer 4.9% 11.8° Amber lager. Schwerter St. Afra Dunkel 4.9% 11.8° Dark lager. Schwerter German Porter 5.8% 16.8° Porter. Glauchauer Weizen Unfiltered pale wheat beer. Glauchauer Schwarzbier Spezial 15º Dark lager - Schwarzbier. Specht Pilsner 4.8% 12º Pils. Greifensteinquell Landbier 4.8% 12º Pale lager - Helles. Specht Export 5% 12.9º Pale lager - Export. Specht Spezial 5% 12.9º Pale lager - Spezial. Schwarzer Specht 6.1% 16º Dark Bock. Specht Bockbier 6.1% 16º Pale Bock. Seasonal - September to April. Independent brewery. The brewery was run as a co-operative until bankruptcy in 1954, when it was bought by Gustav Specht. The Specht family have been in charge ever since, the brewery remaining in private hands throughout the DDR period. Sternquell Pils 4.9% 11° Pils. Grass, cardboard and celery aroma; bitterish taste with grass, hop and dust aromas; bitter, grassy finish. Sternquell Diät Pils 4.9% 11° Pils. Low-carbohydrate beer. Sternquell Dunkel 5.3% 12.6° Dark lager. Sternquell Premium Pils 5.4% 12° Pils. Sternquell Sommerbier 3.6% 9.25º Pale lager - Schankbier. Seasonal - Summer. Bitterness 15.6 EBU. Sternquell Bockbier 6.5% 16° Dark Bock. Seasonal - November to Märch. Owned by the Kulmbacher Brauerei AG. A personal favourite from the DDR period. They used to brew a very tasty Pilsator. Magarine and butter aroma; bitterish taste with butter and grass aromas; bitterish finish with butter and wood aromas. Thomaskirche Spezial Dark lager - Schwarzbier. Hop and margarine aroma; bitterish taste with hop, basil and herbal aromas; bitter finish with liquorice, hop and citrus aromas. Brewpub in Leipzig city centre. Torgauer Doppelcaramel 1.5% 11.6º Malzbier. Bitterness 9 EBU, colour 140 EBC. Torgauer Hell 4.7% 11.2º Pale lager - Helles. Bitterness 21 EBU, colour 9 EBC. Torgauer Meister Pils 4.9% 11.6º Pils. Bitterness 30 EBU, colour 6 EBC. Torgauer Landpils 4.9% 11.8º Pils. Bitterness 28 EBU, colour 7 EBC. Torgauer Premium Pilsner 4.9% Pils. Bitterness 28 EBU, colour EBC. Torgauer Landbier 5.5% 12.5% Pale lager - Spezial. Bitterness 23 EBU, colour 8 EBC. Malt, honey, vanilla, peach, tobacco and grass aroma; sweetish/bitterish taste with malt, hop and fruit aromas; bitter finish with butter, malt and herbal aromas. Torgauer Landbock 6.5% 16.5º Dark Bock. Bitterness 20 EBU, colour 78 EBC. Torgauer Maibock 6.5% 16.6º Pale Bock. Bitterness 18 EBU, colour 15 EBC. Seasonal - Spring. Torgauer Weihnachtsbier 5.7% 12.9º Pale lager - Festbier. Bitterness 23 EBU, colour 13 EBC. Torgauer Ritter Edel 5.5% Pale lager. Grass and butter aroma, neutral taste with butter and grass aromas, bitterish, fruity finish. Torgauer Ritter Dunkel 6.9% 16º Dark bock. Metal aroma, sweet taste with fruit and toffee aromas, bitterish finish with raisins and toffee. Chemnitzer Turmbräu Hell Pale lager. Unfiltered. Chemnitzer Turmbräu Kupfer Amber lager. Unfiltered. Waldschlösschen Original Hell 5.3% 12.3° Pale lager - Export. Waldschlösschen Zwickelbier 5.3% 12.3° Unfiltered pale lager - Export. Waldschlösschen Hefe 5% 12-13° Unfiltered pale wheat beer. Waldschlösschen Dunkel 5-5.5% 12-13° Dark lager. Brewpub. Closed in 1981, but re-opened as a brewpub in 1997 as part of a redevelopment of the former brewery site. Watzke Pils 5% 12.9° Pils. Unfiltered. Altpieschener Spezial 5.2% 13.6° Amber lager - Märzen. Unfiltered. Watzke Märzen 5.4% 13.5º Amber lager - Märzen. Unfiltered. Seasonal - March. Watzke Dunkler Doppelbock 7.3% 18.8º Dark Doppelbock. Unfiltered. Seasonal - Winter. Watzke Porter 6.3% 16.5º Bottom-fermented porter. Unfiltered. Seasonal. A brewpub bizarrely sited in a large dancehall complex. Weesensteiner Schlossbräu Unfiltered pale lager. Wernesgrüner Pils 4.9% 11.3º Pils. Bitterness 30 EBU, colour 6 EBC. One of the DDR's former "export breweries", used as a source of hard currency. It was often difficult to find in the DDR itself. Despite the brewery having access to the best raw materials, the beer was never one of my favourites. Since reunification increasing quantites of Wernesgrüner have been sold in West Germany. Wittichenauer Gold 4.4% Pale lager - Helles. Lausitzer Premium Pils 4.9% Pils. Wittichenauer Premium Pils 5% Pils. St. Marienstern Klosterbräu Spezial 5% Pale lager. St. Marienstern Klosterbräu Dunkel 5% Dark lager. As the name implies, the pub has a skittle alley. Zwönitzer Dunkel 4.9% Dark lager. Zwönitzer Nachtwächter Schwarzbier Dark lager - Schwarzbier. Zwönitzer Kirsch-Bräu Beer with cherries. Zwönitzer Äppel-Bräu Beer with apple. Alter Dessauer Original Pale lager. Alter Dessauer Edles Pils 4.9% Pils. Alter Dessauer Zwickelbier Unfiltered pale lager. Colbitzer Heide-Schwarzbier Dark lager - Schwarzbier. Colbitzer Ritter Premium Pale lager. Colbitzer Heidebock 6.8% Pale Bock. Independenrt brewery. Nationalised in 1972. Sold back to members of the founding family in 1991. Garley "Swartet Beer" 4.5% Dark lager - Schwarzbier. Garley Premium Pilsner 4.9% Pils. Garley Premium Spezial Export 5.1% Pale lager - Export. Altmärker Narrenbräu 5.2% Made from malted oats. I thought the Reinheitsgebot didn't allow the use of oats, even if malted? Festbier "100 Jahre Elektrische" Festbier. Garley Maibock Pale Bock. Seasonal - April. Garley Bock 6.5% Amber Bock. Seasonal - October. Altmärker Weihnacht Festbier. Seasonal - November/December. Independent brewery. Nationalised 1972, privatised 1990. Organic brewery in a building that was first a castle then, until 1954, a prison. The complex also houses a hotel. Erste Hallische Gasthausbrauerei "Zum Schad"
Hasseröder Premium Pils 4.8% 11.3º Pils. Hasseröder Pils has come from nowhere to be a major brand in Germany in the space of ten years. It now produces more beer than any other brewery in the former DDR. Heine Bräu Hell 11.5º Pale lager. Unfiltered. Heine Bräu Dunkel 11.7º Dark lager. Unfiltered. Heine Bräu Maibock Pale Bock. Seasonal - Spring. Unfiltered. Heine Bräu Oktoberbock Bock. Seasonal - Autumn. Unfiltered. Heine Bräu Weizen 11.4º Pale unfiltered wheat beer. Köthener Spezial Pils 4.9% 11.5º Pils. Hubertus 1861 Premium Pilsener 4.9% 11.5º Pils. Köthener Export 5.2% 12.5º Pale lager - Export. Hubertus Schwarzbier 5.2% 12.5º Dark lager - Schwarzbier. Hubertus Bock 6.9% 16.5º Dark Bock. Seasonal - October to December. Landsberger Schwarzbier Dark lager - Schwarzbier. Landsberger Low-Carb 5% 10º Pils. Low-carbohydrate. Landsberger Export-Bier 5.3% Pale lager - Export. Delitzscher Peter und Paul Festbier 5.3% 12º Pale lager - Festbier. Landsberger Goitzsche Bräu 5.6% Amber lager - Märzen. Zeitzer Grottenbräu 5.6% Pale lager - Festbier. Aschersleber Festbier 5.6% Pale lager - Festbier. Landsberger Bock-Bier 7.2% Dark Bock. Landsberger Mai-Bock 7.2% Dark Bock. Seasonal - April to June. Pubarschknall Braunbier. Top-fermented. 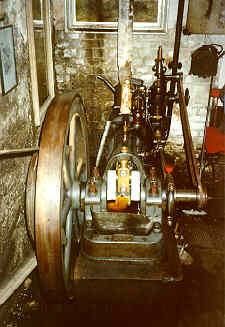 A recreation of a pre-lager style. Lüdde-Schwarzbier Dark lager - Schwarzbier. Lüdde - Weizen Pale unfiltered wheat beer. Lüdde - Bock Bock. Seasonal. Brewpub. The original brewery closed in 1966. Re-opened as a brewpub in 1992. Mammut Schwarzbier black 4.9% Dark lager - Schwarzbier. Mammut Export 5.5% Pale lager - Export. Mammut Ur-Bock 6.9% Dark Bock. Part of the Actris Gruppe. Maibock Bock. Unfiltered. Seasonal - Spring. Schollator Bock. Unfiltered. Seasonal - Autumn. Reformator Herren-Pils 4.9% 12° Pils. Reformator Dunkel 5.9% 15° Dark lager. Reformator Hell 4.9% 13° Pale lager - Helles. Seasonal. Reformator Festbier "St. Martin" 5.2% 13.5° Pale lager - Festbier. Seasonal. Reformator Märzenbier "Kupfer" 5.8% 14° Amber lager - Märzen. Seasonal. Reformator Bock "Schwarze Schlacke" 5.5% 16.5° Dark Bock. Seasonal. Owned by Garley Bräu. Nationalised in 1972. Weizenbier Pale unfiltered wheat beer. Seasonal - Summer. Brewpub in a restaurant/hotel complex.